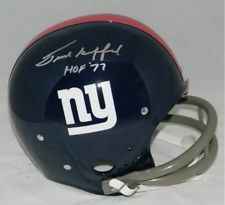 Frank Gifford football cards and autographed memorabilia are popular with vintage hobby enthusiasts. He was a fan favorite with the New York Giants and one of the franchises first stars. He is known for playing both offense and defense, long after the NFL expanded its rosters to include specialists for each side of the game. 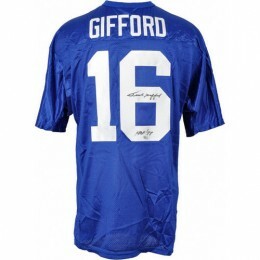 Gifford was an eight-time Pro Bowl selection and helped lead the Giants to the NFL Championship Game five times. He was awarded the league MVP in 1956 after winning the title game. After his retirement from football, he was a longtime broadcaster and maintained a public persona. 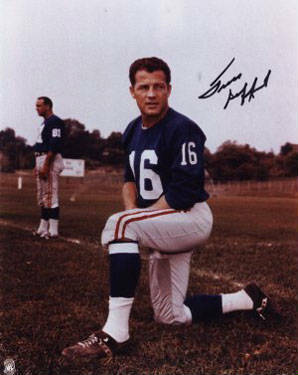 Frank Gifford has two rookies cards. Both come from 1952 Bowman. That year, the company released two versions of their football set, 1952 Bowman Small (2 1/16" x 3 1/8") and 1952 Bowman Large (2 1/2" x 3 1/8"). Both sets had the same number of cards and differed only in size. However in terms of collectibility, it is the Large version that gets the most respect. Gifford's first certified autograph card is from 1989 Goal Line Art. It has a serial numbered print run of just 100 copies. Other popular early autograph cards include those from 2000 Fleer Greats of the Game and 2000 Upper Deck Legends. His first memorabilia cards are in 2001 Leaf Certified Heritage Collection. The regular version of the card is serial numbered to 100. A Century parallel was also produced. It is not serial numbered but has a known print run of 21. Frank Gifford has long been a regular on the national autograph circuit. Supply of his autographed items slightly outpaces demand. However, that trend should reverse in the coming years as he enters the late stages of his life. 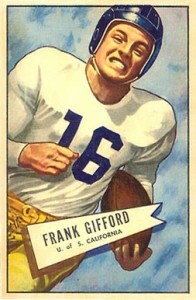 Gifford's card is one of the easier ones to find in the set. It is not a high number, nor is it a short print. However, it is notorious for being difficult to find with good centering. 1952 Bowman Large was a test issue and is considered to be one of the most esteemed post-war football card sets. 1952 Bowman Small doesn't carry the same kind of premium as its Large counterpart. It is still highly collectible and well respected within the hobby. Centering is slightly less of an issue on the smaller version. 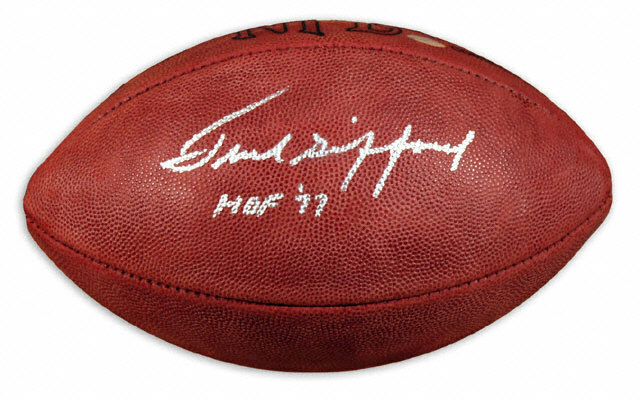 Below you will find an example of what Frank Gifford's authentic signature looks like. This can be used as a first point of reference for determining the legitimacy of autograph memorabilia, but is not a substitute for having your items authenticated by a well-respected professional autograph authentication company. Some of the trusted sources within the sports memorabilia market include the following companies: PSA, JSA, Tristar, and Mounted Memories. Click on any of the images below to view full size photos. The "F" is the largest letter with a curved capping line on the top of the letter. No middle intersecting line is present. The "r" is represented by an up and down stroke. The "a" shows no opening in the center. The "n" resembles the "r" but smaller. The "k" shows just one extending line off the vertical instead of two. The "G" is visible and the "i" is not dotted. The "f"s often vary with the second one having a loop on the bottom portion. The remaining letters are legible. Repeating letters from the first name have the same characteristics. The "d" is not always closed fully and the vertical line leans to the right on a slight angle.